Writing is not something I have to force my youngest three kids to do, they enjoy writing. Alaina just needs some help getting her thoughts together and organized. The last several weeks she has been using the new Apologia Educational Ministries writing curriculum called Writers in Residence. 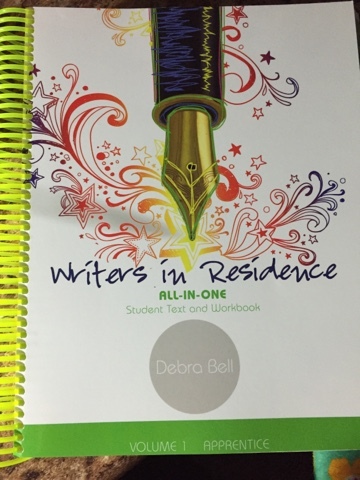 Writers in Residence Volume 1 by Debra Bell is recommended for grades 4-8. It includes writing and grammar instruction using a four day a week schedule. It comes with the Student Text & Workbook and the Answer Key. By helping kids understand language arts this program will help them create stories that people will want to read. I Remember- These writing prompts have the students think about things they have done in their lives and has them master a personal narrative. I Imagine- Students look at fictional work and see how authors pull from their own experiences to create fiction. The creative writing assignments include short stories, poetry, and novels. 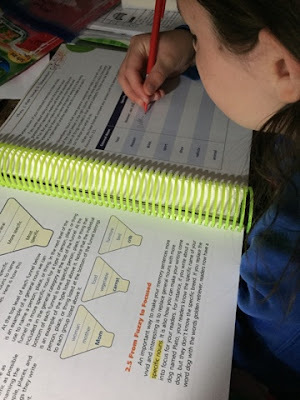 I Investigate- The writing prompts introduce research skills and writing. I Think- Opinion essays are the last type of writing. This section in volume 1 is the first step to more formal arguments in later volumes. 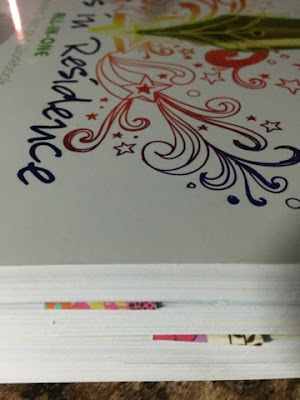 Writers in Residence Student Text and Workbook is written directly to the student in a conversational tone and very easy for the student to understand what is going on. There are 24 modules and each section in the module is numbered. So Module 1 starts with 1.1 The Assignment: When I Was Young and goes to 1.16 Revisit: Writer's Questions. 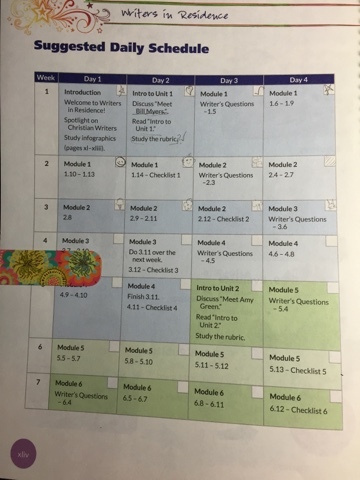 Then in the Suggested Daily Schedule all lesson numbers are included in that day's box. As the student reads through the modules there are boxes, questions, charts, and practice work mixed in. At the beginning of each module there is a rubric to show the student what they should focus on in the writing assignment. Then at the end there is a checklist with a point system to make awarding points easy. Parts of speech and punctuation are worked on throughout the book and the student gets to meet Christian writers in a question and answer spotlight. The Answer Key is an 144 page softcover book. The introduction explains how to use the answer key and how to evaluate the students writing by using the rubrics. 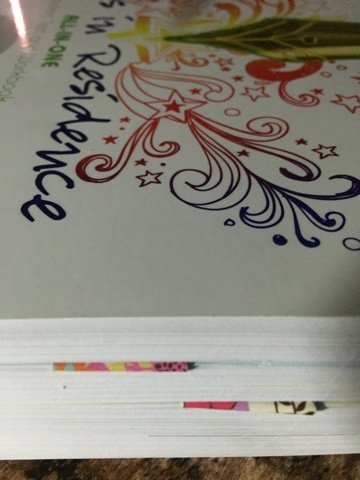 It also contains all the assignments as they appear in the student book except the answers are completed. Alaina is 11 and she has been using Writers in Residence. As soon as we got our package open Alaina loved the book. It is very pretty with a bright green spiral coil and colorful squiggles throughout the book. The text boxes, outlines, tabs, and even the page numbers are colored. The next day we were at Hobby Lobby and she found some magnet book marks with colorful flowers and squiggles that would match her new book perfectly and she just had to have them. She keeps one on the page she is currently working on and another one on the Daily Schedule page so she can easily check off what she has completed. The way the modules are numbered make it very easy for Alaina to see what she needs to complete each day. And she loves creating little pictures inside the checkoff box on the schedule page. She also likes to compare her work to real authors and she loves that she has her own checklists and point system. I, Alaina, can turn invisible! I often save very sweet fruits from Evil Cheesecake Face. He steals them to look very handsome and they give him more energy when needed. I creep around with my invisible power and I stalk Evil Cheesecake Face to rescue the fruits. There is one fruit he seems to be very keen about and that is the sweet yet dull sparkle flavor you get in a blueberry. I do my best to save them with my invisible power. For the most part Alaina has been working on this on her own. We do go over the rubric and the checklist at the end together. I even give her some input in the points she earns. Alaina likes this program for the visual appearance and it has more of a notebooking look instead of a workbook. She loves pretty things and checklists and this has been a perfect fit for her. I think it is working for her because she sees a purpose in her writing. 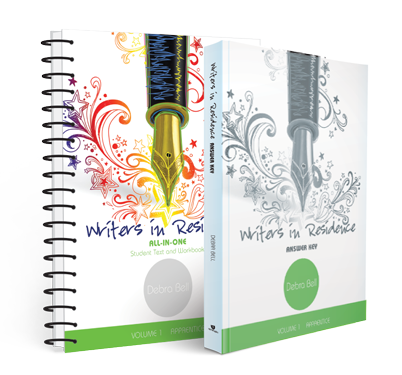 By comparing professional authors with her writing she can visually see how her writing can become something other people will want to read. Volume 2: Journeyman, Volume 3: Craftsman, and Volume 4: Master Craftsman are forthcoming and I'm hoping they are ready when Alaina is finished with volume 1.